Sage Doors, a family owned business, has partnered with MKT GmbH from Germany to supply Alphatape™ laser edgetape to the cabinetmaking industry across New Zealand and Australia. As the first company in New Zealand to begin manufacturing doors and panels using laseredge technology, Sage Doors needed to source a laser edgetape before they could begin production. MKT, a German edge tape manufacturer was soon chosen for their high quality product – Alphatape™. Europe is known for quality when it comes to the furniture industry, and MKT is no exception. Sage Doors has partnered with MKT to become a leading supplier of Alphatape™ throughout New Zealand and Australia. Running their own Homag KAL310 airTec edgebander to manufacture doors for cabinetmakers over the country, Sage Doors understands what is involved in achieving a seamless edge. Not all edgetapes are the same, and the quality of the edgetape used plays a huge role. Laser edgetape consists of two layers: a ‘hard’ décor layer and a meltable functional layer. The ‘functional layer’ consists of polymers which enable it to melt faster than the outer surface of the edgebanding. When the functional layer is activated/melted and applied to the board, the melted functional layer fuses to the MDF to create a seamless joint. What makes Alphatape™ different than other laser edgetapes on the market? Alphatape™ features a very hard functional layer (back layer), which helps ensure a seamless edge. A soft functional layer catches dirt and looks like a glue line over time. you can mark the functional layer with your thumbnail. You should not be able to make any visible mark at all on the back of the functional layer. Why Polypropylene (PP) instead of PVC or ABS? Hot-air and other laser edgebanding techology uses extreme heat to melt the functional layer on the back of the tape. MKT’s Alpha Tape Zero PP (Polypropylene) edgetape is the ideal material for this hot-air technique as it doesn’t shrink during cooling like other plastics, ensuring a seamless edge with no shrinkage step in the join. Polypropylene is also much more environmentally friendly compared to other plastics. To achieve the highest quality functional layer, MKT’s Alpha Tape Zero PP is co-extruded as opposed to post-coated. Co-extruded = imagine two toothpaste tubes squirting out edgetape material, one on top of the other, onto the extrusion line. The décor layer comes through the top hole and the functional layer through the bottom as the edgetape is being made. Post-coated = regular ABS edgetape is manufactured, after which a heat activated glue/functional layer is applied to the back. This is similar in fashion to a preglued edgetape. Alphatape™ is manufactured in jumbo rolls 405mm wide to ensure the functional and décor layers are a consistent thickness, colour and finish. This jumbo roll method also eliminates variation caused by a change of tooling and extrusions for different widths. The wide rolls of edgetape are then sliced into required widths (we stock a range of 21mm, 28mm, 35mm, 40mm & 63mm). MKT’s Alphatape™ is tailor-made to match the board on which it is applied. 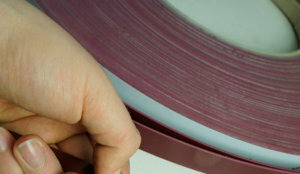 With laser edgetape, two colour matches are required – the colour of the décor layer and the functional layer. It’s important these colours are very precise to create an invisible, seamless joint. One huge advantage MKT has in their precise colour matching lies in their sister company – Printec GmbH. Printec manufacture and supply a wide spectrum of plastic dyes and inks to many market sectors in Europe. MKT puts quality first; during the manufacturing process, the edgetape regularly undergoes manual and electronic inspections of various characteristics, including the colour and/or printed image to ensure a high quality material. Sage Doors stocks a range of colours and finishes, from velvet and textured woodgrain to Extreme Gloss™ to Extreme Matte™. The Excellent Gloss ™ finish features an exceptional high gloss level, like that of an acrylic gloss material. (Most high gloss edgetapes are dull compared to the board they are applied to). If you have a laser edgebander and would like a free sample of MKT’s Alpha Tape Zero PP edge tape to try, contact us and we’ll courier a sample pack to you.